As some of you know, this time of year is my favorite time to truly reflect on the past and the future. Things seem to slow down enough that there’s finally time to ponder and think and plan and dream. The questions and thoughts change as I get older. When I was younger, it was more about what I wanted to accomplish (although I still have a VERY ambitious list for that). Now, it’s a little bit more of what do I want to leave behind? The thing about life and reality is that it is so fleeting. 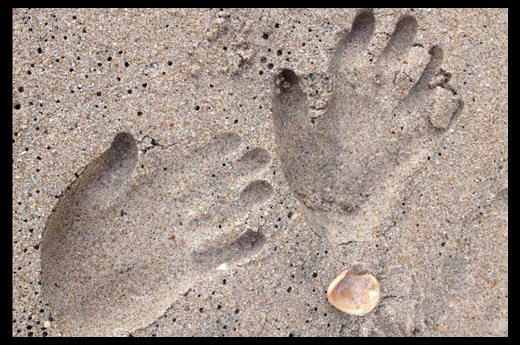 Things that seem huge and vastly important can become footnotes to history or, like handprints in the sand—here today, gone tomorrow—washed away by wind or a wave. But I firmly believe that if we don’t think about it—and aren’t awake about it—we simply drift through life asleep and miss the best of it. In fact, I kind of believe that part of our purpose here in life is to create it, create change, push evolution forward, and improve things. To me, leaving a mark isn’t about getting credit or recognition, but making sure that the things we do have a positive impact rather than a negative one, and I think that starts in our heads and our hearts. So I urge you to take some time for yourself this week, carve out an hour or, better yet, a day when you can really open your heart and calm your head enough to dream about what you truly desire. If you can dream it, you can create it. And then your life will leave a wake of happiness and joy. I love this post — thanks for the reminder. Sadly, I need it more than I wish were the case! This blog offers beautiful pearls of wisdom – some of which I have acted upon. Recently I took an entire day to reflect on my life and the mark that I will leave behind. Life can be so busy sometimes and it’s easy to forget how important taking time to reflect on this topic truly is. Although I feel good about the “wake” my life has in making things better for others, I find there is much room for improving that. I’m going to do some more reflection, perhaps follow through on some of those great tips for enjoying one’s garden – like walking barefoot on my organic lawn and taking the time to smell the wonderful scents from my flower gardens. Thank you for sharing your thoughts and reflections. It’s making a difference in my life. i love maria…. just love all i read… on her links thank you Maria.